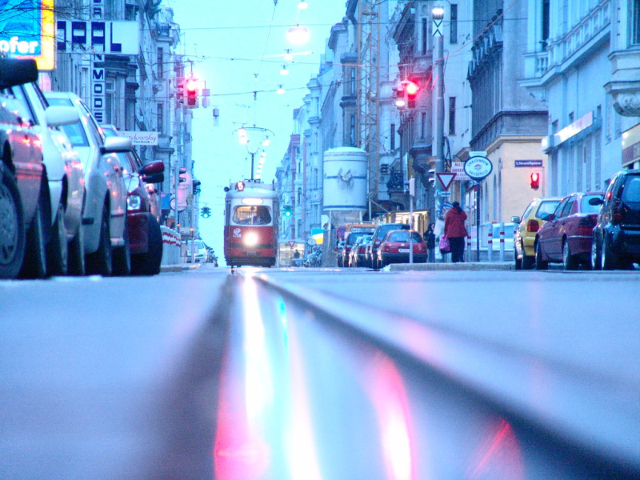 An early morning tram travels down a street in Vienna. 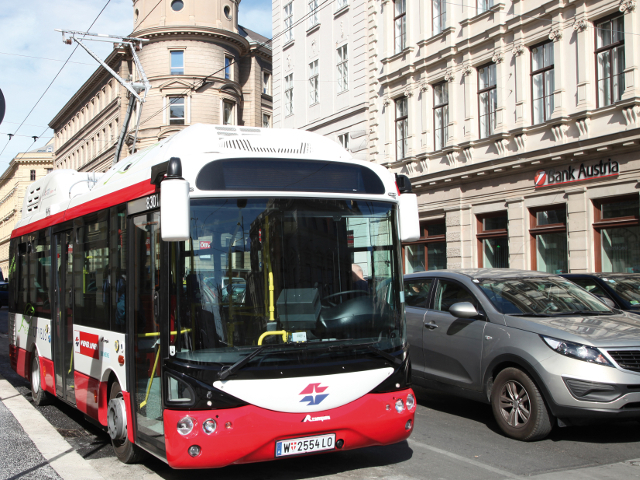 Vienna’s new buses rely on the city’s extensive tram network for electricity. Photo by Julian Turner. Vienna is home to one of the largest tram systems in the world, extending 227 kilometers throughout the greater Vienna area. But as the city has grown, trams have been supplemented with metro trains, gas-powered buses, and other forms of transport. This summer, in efforts to reduce emissions and create a cleaner, quieter downtown, Vienna is using its old tram infrastructure to power brand new electric buses. During the day, the new buses will recharge their batteries in fifteen minute intervals using the tram system’s overhead power lines. At night, they will recharge fully at their charging stations. To date, only prototype electric buses have been in service in Europe. Vienna is the first city to operate a full fleet of electric buses throughout the city center. One of these buses has been experimentally running since the fall of 2012, but this summer, Vienna launched the fleet of twelve new buses, each of which can carry forty passengers. These new buses, which cost twice as much as a comparable diesel bus, will replace old buses which ran on liquefied petroleum gas. Unlike trams, the buses can go anywhere, leaving the tram tracks and power lines behind. Unlike gas-powered buses, these buses will be cleaner and quieter as the roll through the heart of the city. Of course, the actual electricity used by the buses is only environmentally friendly if it is sustainably generated. But creating an infrastructure which relies on electricity rather than gas paves the way for the development of affordable renewable electricity. The electric buses are also more energy efficient – even with current electricity sources, city officials estimate the new buses will reduce Vienna’s carbon dioxide emissions by 300 tons a year. The new buses are part of a wider trend towards green transport systems in European cities. Vienna, along with many European cities, is striving to be a leader in green transport, thanks to the European Union’s serious climate targets. The New York Times called the electric buses part of a “slow-motion revolution in urban transit.” Many cities have found that investing in sustainable transport is one of the most efficient ways to reduce their emissions and meet their climate goals. Though investing in new electric buses can be expensive, the ability of these buses to use the existing tram infrastructure reduces the city’s costs significantly. The innovative technology allowing these buses to charge off the tramlines was developed by Siemens, which expects the technology to take off in other cities with tram infrastructures. Siemens is already in talks with at least five cities in Europe and two in South America that have such tram lines. As countries around the world work to reduce their emissions in the face of climate change, they will likely turn to innovative solutions like Vienna’s electric tramline-powered buses. In the meantime, Vienna’s streets are quieter and its transport is more sustainable. The new buses are powered by electricity and energy efficient. Other cities in with tramways are good candidates for replicating this successful electric bus system. Photo courtesy of Seimens. Friday Fun: Want to see your photograph on TheCityFix?